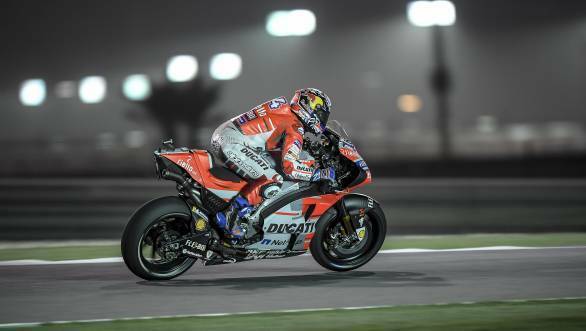 Andrea Dovizioso took first place at the season-opening round of the 2018 MotoGP championship at Qatar. The Ducati rider held off a hard-charging Marc Marquez on the last lap of the race, and clinched victory at the event. Marquez finished second for Repsol Honda, while Valentino Rossi finished third for Yamaha. While Dovizioso didn't have the easiest of starts in the race, it was Johann Zarco of the Tech 3 Yamaha outfit who led the pack from pole. The Frenchman held onto his position until the 15th lap, which is when Dovi made it through to the lead. Marquez made it to second on track on the same lap, after which he set about pursuing Dovi. While we were treated to a fine battle for victory, it was a throwback to 2017, it was surprise package Valentino Rossi who muscled his way to third position for Yamaha. Behind, Zarco was slipping down the order, and would eventually end up eighth, in what was ultimately a disappointing outing under the floodlights of Qatar for him. It was Cal Crutchlow who moved into fourth place, finishing first of all the independent runners, while Danilo Petrucci took fifth place. Maverick Vinales took sixth place for Movistar Yamaha, making a good recovery after having qualified no higher than 12th. Dani Pedrosa took seventh place on the second Honda, while Andrea Iannone took ninth for Suzuki Ecstar. Tenth place went to Pramac Ducati's Jack Miller. Pol Espargaro, Alex Rins and Jorge Lorenzo were the three retirements from the race.